A photo of TVXQ’s U-Know Yunho and f(x)’s Sulli’s past has been released. A post was made on an online community thread with the title ‘U-Know Yunho and Sulli 7 Years Ago]. The photo that is included in the post is from SM Entertainment’s 10th Anniversary party in 2006 and shows Lee Soo Man joined by Kangta, U-Know Yunho and Sulli. 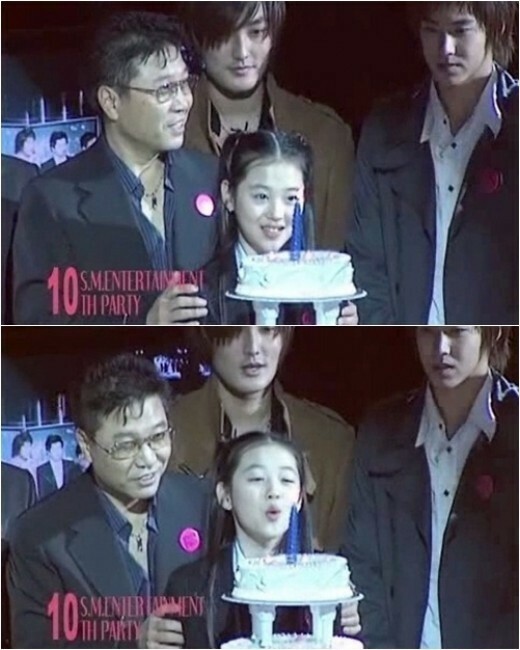 Sulli, who was fifteen years old at the end, is blowing out the candles on a cake with a bright smile on his face while Kangta and U-Know Yunho are standing behind him and looking happy. Sulli has proved that she hasn’t changed with her porcelain-white skin and cute beauty. Thank u so much for translating this article. Pls do translate more of YH related articles. Your efforts are deeply appreciated!